Some call it Nut Grass. Those horrible weeds that connect via root systems and literally, can take over your entire lawn if you let it. I found the ONLY thing that kills the plant/flower AND the root system. In about 7-10 days after spraying, it turns yellow/brown and dies. Yes, new ones from other systems grow, but with consistent application, your yard will return in time to its glory. 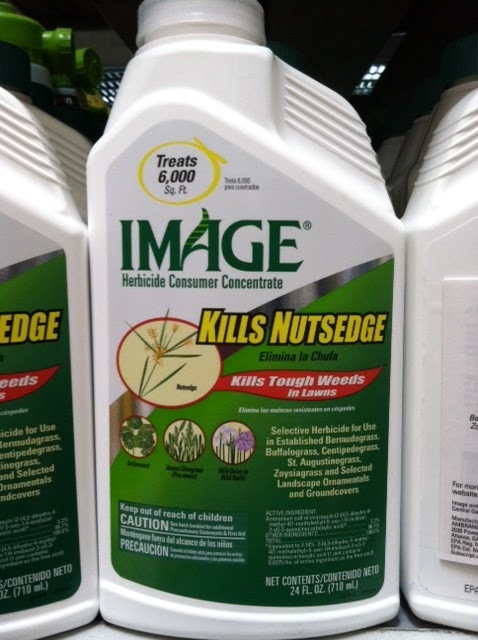 This magical nutsedge killer is by Ortho, IMAGE. You can find it in the spray bottle, or concentrate form. It's sold all over--Home Depot, Lowe's, WalMart. WalMart is the cheapest and they usually have it in stock. Note: In between applying herbicide to your yard, you also need to fertilize your grass. I usually let my grass grow a bit so I can see the nutsedge easily, to aid in application of the herbicide. After the nutsedge dies, I (okay, my yard guy) cut my grass and my lawn is pretty again!